Dell, following in the footsteps of many other PC retailers, just slashed the price of its only Windows RT tablet to a jaw-droppingly low $300. For a limited time—though we'll see if that holds true—you can snag the 32GB Dell XPS 10 for a full $150 cheaper than its original $450 asking price. If you’re willing to spend a little bit more you can get the XPS 10 with a laptop dock for $350, or an LTE model for just $500—a whopping $280 reduction off the original price. Dell’s RT bargain basement sale is just the latest in a long line of Windows RT price drops to try and get ARM-based devices off store shelves. As PC industry analyst Patrick Moorhead recently told us, PCs are like produce: the longer they sit on store shelves, the less desirable they become. And there’s every indication Windows RT is starting to smell a bit ripe. In early April, Windows RT price drops were so widespread that they suggested the OS had failed to gain any traction. Not long after, the market research firm IDC reporte that only 200,000 Windows RT tablets were shipped between January and March. Computer manufacturers are also backing away from RT. Samsung took the RT-powered ATIV Tab off store shelves in Europe and didn’t even bother to release the device in the U.S. Lenovo says businesses don't want it, and Acer says it’s waiting for the Windows 8.1 release before making a decision about producing a Windows RT tablet. On the software side, the Windows Store selection continues to be meh-tastic. That’s especially bad news for Windows RT owners as the Windows Store is the only place you can get apps for those devices. Windows co-chief Tami Reller recently said you shouldn’t expect an RT-flavored version of Apple’s iTunes anytime soon, meaning millions of iTunes users can’t pick up an RT tablet to watch their purchased movies or TV shows. Microsoft expects the Windows Store all the other major iOS app titles to be in the Windows Store by the fall, however. For its part, Microsoft doesn’t plan to stop producing Windows RT, but a course correction may be in order given the lackluster reception to the OS so far. RT or no RT, the big question is: Should you snap up Dell’s bargain while it’s still available? PCWorld’s XPS 10 review rated the device 3.5 out of 5 stars, praising its great battery life and overall design, but dinging it for sluggish performance. The device features a 1.5GHz Qualcomm Snapdragon S4 processor, 32GB storage, a 10.1-inch display with 1366-by-768 resolution, and a 1.4 lb. heft. You also get Office Home & Student RT for free, which includes Word, Excel, PowerPoint, and OneNote. If you buy the laptop dock you can get an extra battery inside the dock to keep your device running for hours longer. That’s not a shabby package for $300 to $350, especially if you're looking for a way to Get Things Done with Office on the road. More pressing of course, is whether you can survive without the large catalog of Windows legacy apps, which can’t run on an ARM processor. You have to ask yourself whether the Windows Store selection is good enough for your needs right now. Our Windows Store vs. the World and Biggest Windows Store No-Shows articles can help you decide the answer to that highly personal question. Or, if you feel like waiting a bit, small-screen Windows tablets are right around the corner, packing similarly small price tags and (probably) backwards-compatible Intel x86 processors. 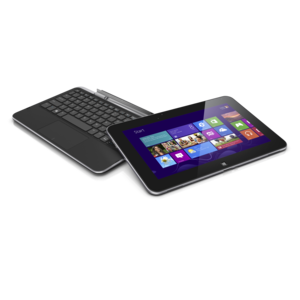 Dell's clever Windows 8 RT convertible tablet delivers sensational run time from its dual batteries, but performance feels sluggish.